NO DOUBLE CHIN, NO SURGERY, NO KIDDING. For the reduction of submental fat under the chin PERMANENTLY and without surgery! Last picture shows results after 2 treatments. 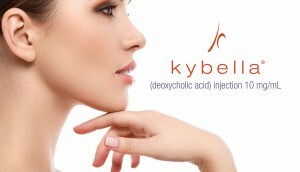 Kybella® is FDA Approved for treating submental fat under the chin. That’s a savings of $200 per vial on your Kybella treatment between now and March 31st, 2019. * Rebate is for entire treatment, not per vial, but the $200 OFF IS per vial. Treatments must be 30 days apart to earn additional $50 on additional treatment. The makers of Botox and Juvederm now introduce the newest beautification prescription injectable with Kybella®. Kybella permenantly treats and alleviates submental fat (fat under the chin, or ‘double chin’) resulting in a more streamline appearance in both profile and at any other angle. Approved by the U.S. Food and Drug Administration (FDA) in May 2015, Kybella has not only changed game for the reduction of submental fat, but has accomplished this without expensive and painful surgery. OU Beauty was one of the first centers in the U.S. to offer this treatment, starting in late June 2015. Dr. Kojian is one of the lead physician/trainers in the Los Angeles, Pasadena-Glendale areas and all of OU Beauty’s R.N. injectors receive advanced training for Kybella injections. * First treatments are normally 2-3 vials, however follow up treatments are usually 1-2 vials. Two treatments is usually enough for moderate submental fat, but may take more depending on your goals and starting point.